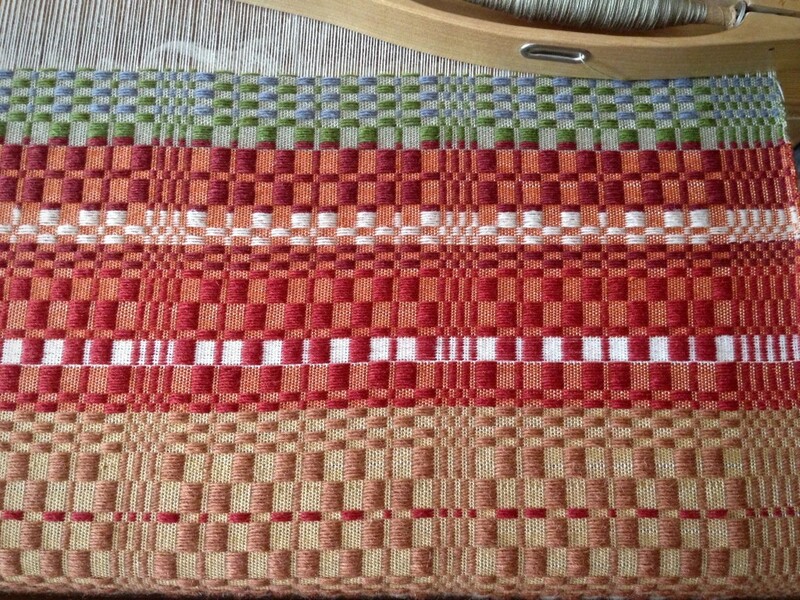 After a solid hour of weaving, I have produced only two more inches (5 cm) of woven fabric. 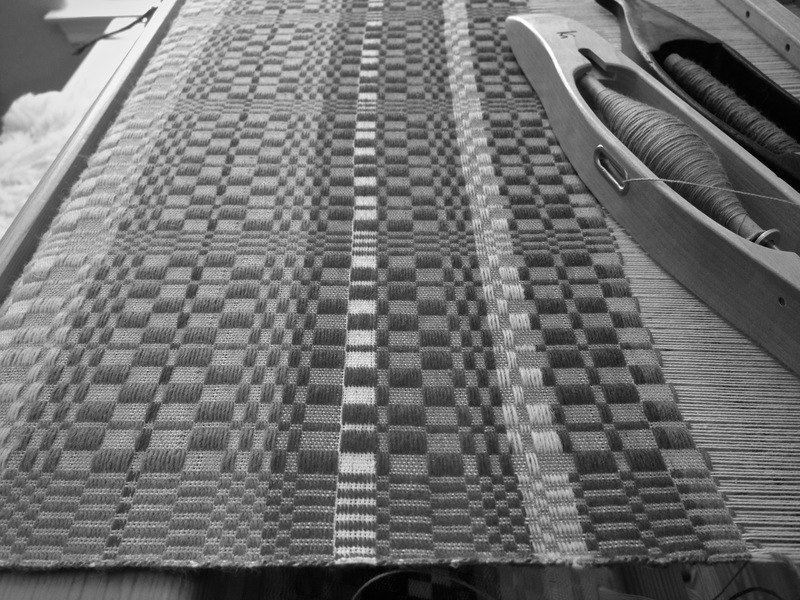 I am completely enthralled with the process, though, of this intriguing monksbelt weave. Some of the best things take the most time. Walnut boat shuttle is an Ebay find. It appears to be an antique Swedish shuttle. I like the way it fits in my hand. The fabric measures 4 inches (10cm) from the beginning of the Rust and Brick section to the fell line. I long to feel the completed cloth in my hands. This weft rep monksbelt is new to me. I honestly don’t know how the hand and drape of the final cloth will be. There is nothing I can do but wait. And, at two inches (5 cm) per hour, that’s a long wait. But I won’t give up. I have enough experience at the loom to know that this is going to be a treasured piece…if I don’t get impatient and cut it off early. Palette of nine wool pattern colors has been selected for this monksbelt project. 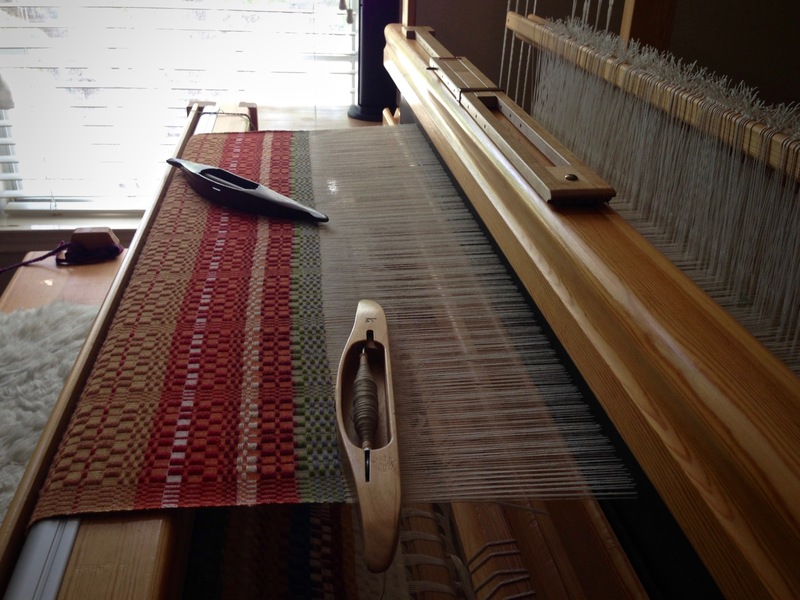 Changing the ground weft and the pattern weft at differing intervals produces an active cloth, reminding me of musical counterpoint. 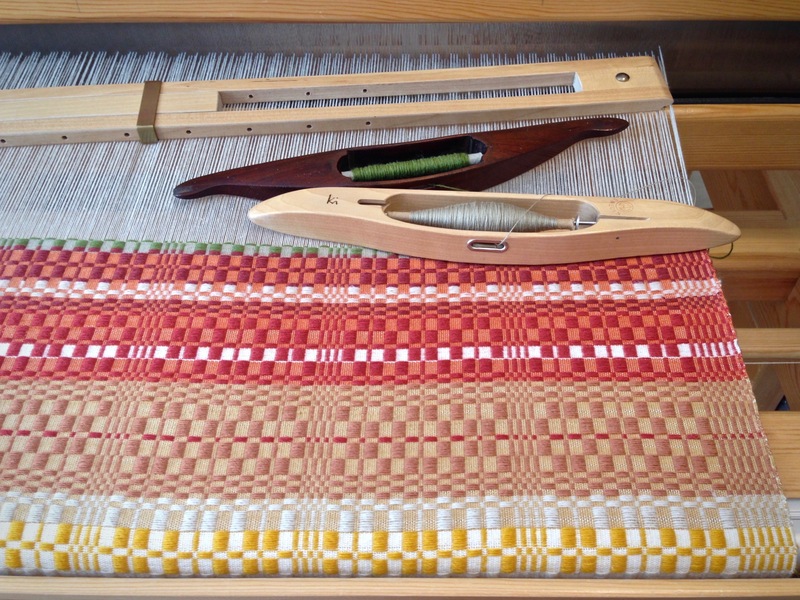 Weaving in the late afternoon–a relaxing and satisfying experience. Temple awaits on the beater, to be re-positioned when the photo op is over. Do you have a prayer waiting to be answered? Sometimes it takes a while. Does that mean that God didn’t hear, or that he doesn’t care? If we could see the invisible, I think we would see things being woven into place–at the right time, in the right way. Do not give up on God. Ask, seek, knock. And remember that our heavenly Father has good in mind for us. May you rest in the wait. Karen: looks great !!! Colonial overshot and damask, when I get in rythem,(sp) I can do about 15″/ hr. Until I get that rythem it’s slow going, but I know all the strips will match and no seam will be visible. The body will only allow me to weave one hour at a time, darn joints, so I’m slow. Hi Linda, I can’t imagine weaving colonial overshot with such precision. Your work must be a delight to see! Steve has made a beautiful cherry ski shuttle for me. I think he will make a boat shuttle one of these days.